Retail asking rents in New York City will drop modestly this year despite the loss of tens of thousands of jobs and the anticipated delivery of 1.8 million square feet in several major developments, Marcus & Millichap Real Estate Investment Services said in a national report released this week. Asking rents are expected to drop for the second straight year to $68.73 per foot, a fall of 2.3 percent from $70.33 per foot in 2008. That was a .2 percent drop from $70.48 per foot in 2007, the report said. “While large retailers are faring well in the metro [area], concern has mounted regarding the health of mom-and-pop and boutique tenants,” the report’s authors said. New York City’s ranking fell from fourth place to sixth in the national index of 43 major markets because of a weaker job outlook, with 105,000 jobs expected to be slashed in the city this year, according to the report. Significant deliveries in the city include the 485,000-square-foot East River Plaza in East Harlem and the 1 million-square-foot Gateway Center in the Bronx Terminal Market.The top market in the national survey was San Diego and the lowest was Kansas City, Miss. 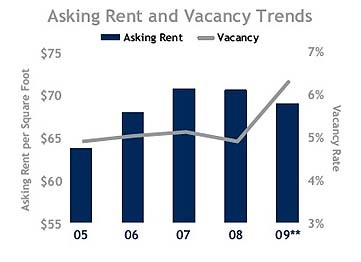 Nationwide, despite a 30 percent decline in new retail completions in 2009, the vacancy rate is expected to rise by 1.8 points to 10.2 percent and asking rents are predicted to fall by 4.5 percent, the report said.